Starting on September 27, this new choir in Brisbane doesn't require you to audition or to read music, but to love singing folk songs. It's director, Nicole Murray, has spent twelve years touring with well-known folk duo, Cloudstreet, and specialises in close harmony singing from the Australian, English, Scottish and Irish traditions. Having wound back the touring schedule a little, she is excited about sharing the wonderful songs she has collected, with a new group of singers. The Folk Choir will explore songs in two, three and four-part harmony, including call-and-response songs such as shanties, a ballad or two from the Child collection, and works by contemporary folk songwriters. Each night starts with vocal warmups and short songs, then working on parts for new songs, and finally finishing with a big sing. 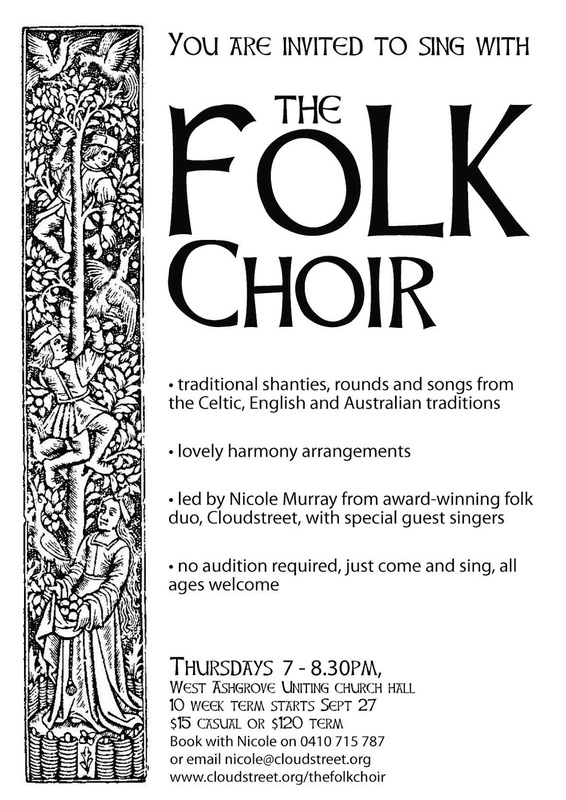 If you love to sing and you want to learn more about harmony, come to the Folk Choir. $15 casual, $120 full term of 10 weeks. Sept 27 - Nov 29.